We’ve been hit with another virus, this one is a cold. Luckily the boys haven’t gotten it yet. I hope that yesterday was the worst of it and I can spend the next few days getting my energy levels back up to be back to normal by the weekend. Mark and I have a get a way planned for our anniversary (9 years!) and we want to learn how to surf. It should be fun! Isn’t it beautiful? 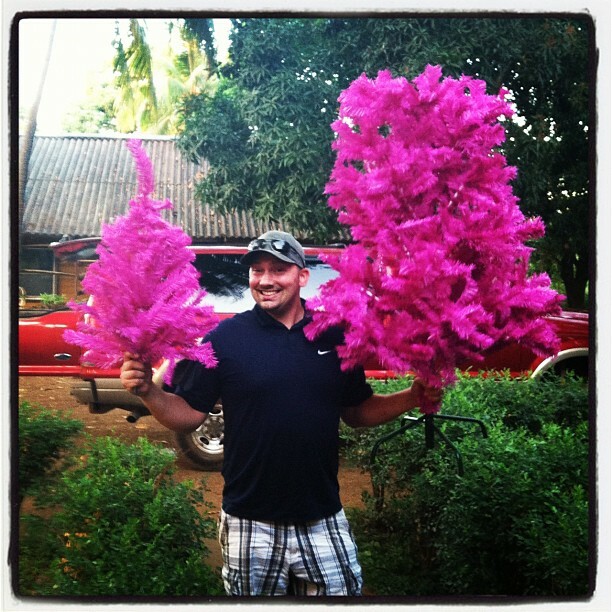 It’s a Nicaraguan Purple Spruce, they are native here. It’s the only tree that the store had that wasn’t ridiculously expensive (like $200 expensive for a 4 foot tree!) and it was on closeout clearance (I can’t imagine why!). We bought some green spray paint and it’s certainly not perfect but it is much better than before, so we’re rolling with it. We’re pretty excited to have a tree and put our ornaments up. These coming weeks it’s a sprint to Christmas! Today we have a friend coming in last minute…her adoption is going to be finalized in the coming month and she starts fostering her son! We are so excited for them! Thursday is graduation, Tate has a Christmas concert, and Friday we head out for our weekend away. Next week Nana gets back which we are all very happy about, Tate finishes school, and the following week my parents come into town! We are so blessed to be surrounded by family and friends during our first Christmas away. In this season of busy, our prayer is that you are able to carve away time to enjoy some quiet time with Jesus and those you love most.